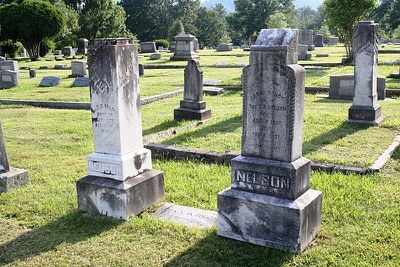 Oakdale Cemetery's establishment coincided with one of Hendersonville's most prosperous periods between 1879 and the early twentieth century, when the Spartanburg and Asheville Railroad reached Hendersonville from the east and the railroad connected Hendersonville to Asheville in 1886. This railroad line linked Hendersonville to the Ohio Valley and opened the local business community to national markets. The cemetery's establishment reflects the city government's recognition that there was a need for a public burial ground on the outskirts of the city for both white and African Americans that would be supervised and professionally maintained by white and African American organizations. After the cemetery's establishment, the city drafted an ordinance prohibiting people from being buried within the city's corporate limits, and specifying that they were to be buried only at Oakdale Cemetery. Preventing burials within city limits was an attempt by the city to protect the general health of its citizens, the value of surrounding properties, and prevent any potential nuisances created by these cemeteries. This was a common practice beginning in the 1840s as part of the Rural Cemetery Movement, when cemeteries were "established around elevated viewsites at the city outskirts" and "operated by voluntary associations which sold individual plots to be marked and maintained by private owners according to individual taste."